When Richard Tracy delivered the first obstetrics and gynaecology lecture over 160 years ago, could he have imagined that in 21st Century Australia almost a third of births would be by caesarean section? Or that one child in every classroom would be conceived through assisted reproduction/IVF, antenatal ultrasound would provide extraordinary images in almost every pregnancy for dating and diagnostic purposes and obstetrics and gynaecology would have subspecialty areas in ultrasound, maternal-fetal medicine, infertility, women's cancer and urogynaecology? Could he have imagined Melbourne University's professor of obstetrics and gynaecology would be a woman, along with several medical unit heads and the majority of obstetrics and gynaecology specialist trainees and medical students? 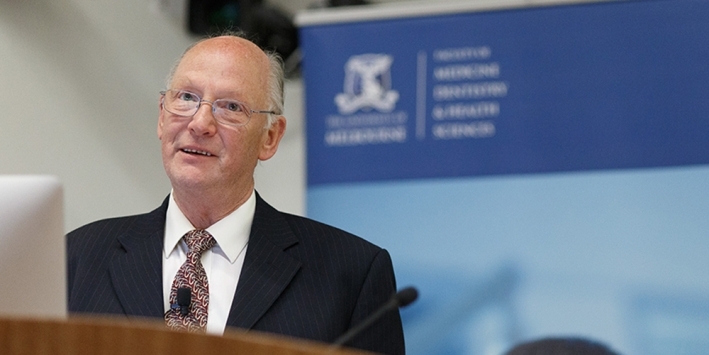 Roger Pepperell, Emeritus Professor of Obstetrics and Gynaecology, University of Melbourne, reviewed some of the clinical developments in the Tracy Maund lecture held on 26 March, 2015. Here are some presentation points from the anniversary lecture. Dramatic reduction in maternal mortality, especially in developed countries. How has this been achieved? Dramatic improvement in perinatal mortality due to advances in obstetric and neonatal paediatric care. Massive changes in the delivery methodology of obstetric care – staff involved, assisted vaginal delivery, Caesarean section rates. Huge changes in various aspects of gynaecologic care. Changes in the legislation and government attitudes and rules concerning many aspects of the care of women. Puerperal sepsis. In the 1800’s and 1900’s there were times when puerperal infection caused massive maternal mortality, the cause of which was then unknown. In some hospitals up to 80-90% of women delivered during a short time period developed such infections and did not survive. Blood loss particularly at the time of abortion or post-partum. Other infective causes – particularly post-abortal bacterial infections (including gas gangrene), or viral infections unrelated to abortion. 50/1000 births (5%) in each pregnancy. Was 4 in 7522 deliveries at RWH in Melbourne in 1964 (0.53/1000 births). Now about 1 per 10000 births in 2010. There have been some definition changes however. What was the RWH Obstetrics situation in 1964? 4 maternal deaths – hepatic necrosis and haemorrhage, uterine rupture with AFE, severe pre-eclampsia resulting in renal failure, and a bile duct malignancy. Diabetic clinic – 16% PNM in diabetic women. Most were stillbirths. Rhesus Immunisation clinic- stillbirths 16%. Perinatal mortality 25.2 per 1000 births. Infants were considered pre-viable if 2 of the 3 following facts applied. What major changes have occurred to reduce the maternal mortality since the 1930’s? Identification of different blood groups and availability of appropriate blood for transfusion in the 1940’s. Provision of antenatal care (early – mid 1900’s). Iron therapy. Recognition and treatment of infections. Availability of antibiotic therapy (1940’s), Diagnosis and treatment of gas gangrene infection. Expert pain relief and anaesthesia for labour and delivery – Pethidine, Morphine, Heroin, GA/ epidural, spinal. Recognition and appropriate management of eclampsia and pre-eclampsia. Delivery is the only curative treatment. Measures to reduce the incidence of pulmonary embolism – earlier ambulation. Establishment of better training facilities for doctors and midwives. In 1900, Karl Landsteiner at University of Vienna, discovered why some BT could be successful yet others could be deadly due to different blood types (A, B, AB and O). Got Nobel prize in 1930. Rhesus blood type not defined until 1937 (Landsteiner and Wiener). In 1939 Levine and Stetson published their findings of a family who had a stillborn baby who had died of haemolytic disease of the newborn. She had a PPH and had a severe transfusion reaction when given her husband’s blood. Both she and her husband were blood group O, but he was subsequently shown to be Rhesus positive and she was Rhesus negative, and had developed Rhesus antibodies. Two major developments came from this work. Recognition of fetal demise due to blood group immunisation. Establishment of the British College of Obstetricians and Gynaecologists in 1929, which became RCOG in 1938. RANZCOG in late 1970’s. Administration of iron supplements to all pregnant women. Recognition and treatment of pre-eclampsia and eclampsia. However, prior to the 1960’s, there was considerable doubt regarding the accuracy of the calculated Estimated Due Date (EDD), induction even when necessary was associated with considerable risks, Caesarean Section delivery carried huge risks, and survival of prematurely delivered babies was very poor. Gas Gangrene infection (Clostridium Welchii) assessment and treatment was dramatically changed by Bung Hill and Hildred Butler in the 1950’s. This often followed backyard abortion. Discovery of antibiotics. Sulphonamides and penicillin were discovered in 1940’s, and their discovery dramatically reduced the deaths from infection following abortion and puerperal infection. The antibiotics now commonly used are referred to as “triple therapy” of a penicillin or cephalosporin, Metronidazole and Gentamicin. Pain relief in labour has changed- pethidine, morphine, heroin etc. At the RWH, the arrival in 1951 of Dr Kevin McCaul from Ireland, who was an expert in epidural anaesthesia, changed the services available. GA now rarely used because of its potentially very serious problems of inhalation of gastric contents or fluid. Epidural anaesthesia now used in about 50% of women in labour at RWH. Produces excellent analgesia in labour. Spinal anaesthesia almost routinely used for anaesthesia for Caesarean Section – but better than epidural anaesthesia for such surgery. Recognize because of BP elevation and proteinuria. Need to check for excessive reflex activity. Administer MgSO4 to prevent eclampsia. Urgently lower blood pressure, to reduce the risk of cerebral haemorrhage, eclampsia, and cardiac failure. Usually expedite delivery, if the problems do not settle quickly with the measures instituted. This is often the only cure. Give extra measures on behalf of the fetus – steroid therapy. Dublin expression or controlled cord traction to deliver placenta, but not to be used until the placenta has separated and the uterus has contracted. If primary PPH occurs, actively treat uterine atony, look for a laceration in lower genital tract, and generally commence transfusion if loss is greater than 1500 ml, even if the maternal pulse and blood pressure are OK. Examination under anaesthesia if bleeding continues to exclude RPOC, cervical tears, uterine rupture, or a partial uterine inversion. Use other techniques if bleeding continues- coagulation factors, bimanual uterine compression, insertion of Bakri balloon, laparotomy to perform B-Lynch suturing, arterial ligation or sometimes a hysterectomy. Earlier mobilisation. Delivered women generally do not require complete bed rest or a prolonged stay in hospital. Use of prophylactic heparin (since the 1990’s) under certain circumstances. Known coagulation disorder which increases the risk of DVT and PE. What other major changes have occurred in Obstetric care at the RWH in the last 50 years? Ultrasound examination introduced in about 1970 – role of Ian Ross and Hugh Robinson at RWH. Now done for many reasons. Urinary oestriol estimation to assess placental function (1960’s). No longer used. Cardiotocographic evaluation of the fetal heart rate started at the RWH in 1970, and has advanced the assessment and care of women antenatally and in labour enormously. But not always easy to evaluate. Assessment of the fetal condition in labour by scalp pH and lactate evaluations, where a fetal heart rate has been found to be abnormal but not apparently requiring immediate delivery. Establishment of special clinics- diabetes, rhesus immunisation, multiple pregnancy clinics, previous premature delivery clinics, maternal-fetal medicine special clinics, etc. Huge increase in Caesarean Section rates – 2% in 1940, 4-5% in 1960, 10% in 1980 and now 30-35%. No change in incidence of cerebral palsy has occurred however. Other antenatal evaluations- exclusion of fetal chromosome abnormalities (MSST, nuchal fold thickness, amniocentesis, fetal DNA), 20 week ultrasound examination, gestational diabetes screening, vaginal GBS screening, special evaluations post-term. Anti-D administration to Rhesus negative women (1968 onwards), has almost wiped out the rhesus iso-immunisation problem. Better treatment of Rhesus immunisation when it occurs (diagnosis of severity, premature delivery, IUFT, exchange transfusion). Role of Sir William Liley in 1963. Treat patients in premature labour with drugs to inhibit uterine contractions (alcohol, tocolytic agents) and give corticosteroid therapy to mature fetal lungs (Mont Liggins, 1972). Give Magnesium sulphate if delivery expected before 30 weeks of gestation to reduce the likelihood of cerebral palsy. Changes in delivery of midwifery care – family birth centres for intrapartum care, midwifery shared antenatal care, COSMOS at RWH. Most are still combined medical & midwifery care. Changes in medical student involvement in the delivery suite, feminisation of the work force, and safe working hours of junior staff. Dramatic changes in care of unmarried women who become pregnant. Advances in neonatal care since the 1950’s. If delivering prematurely, transfer to specialist tertiary hospital, establishment of Neonatal emergency transfer service (NETS). Therapies to reduce elevated serum bilirubin levels to avoid kernicteris. Administration of drugs to improve lung function. Antibiotic therapy if possibly needed, usually triple therapy. Neonatal mortality dramatically declined, and survival of prematurely delivered babies dramatically improved. Initially needed to be at least 28 weeks of gestation at delivery, and more than 1000g at birth. Changed to 20 weeks and 400g respectively in 1971. Worse if multiple pregnancies, or male child. *Concern regarding quality of survival (?20 - 30% retarded). Legalisation of abortion, The Menhennit ruling in 1969. Changes in surgical techniques - laparotomy, laparoscopy, hysteroscopic, fewer hysterectomies due to use of Mirena IUD and endometrial ablation. Changes in contraception – oral contraception – huge dose reductions, injectable progestogens (depo provera, Implanon), intrauterine devices. ovulation induction with clomiphene, dopamine agonists and FSH preparations – results better than virtually all other such centres in the world. Role of staff at RWH. IVF, ICSI, use of donor material, surrogacy. RWH had the first IVF pregnancy in Australia in 1978 when Ian Johnston was head of Reproductive Biology Unit, and Alex Lopata was the research embryologist. Advances in menopausal care – treatment of symptoms, evaluation for breast malignancy, evaluation of osteoporosis, use of various forms of hormone replacement therapy (HRT). Problems of the USA trial. Treatment of cervical cancer, recognition that HPV is the cause of cervical cancer, HPV immunisation, recognition and treatment of various other malignancies (endometrial, ovarian and chorio-carcinoma). Advances in urogynaecology for women with urinary incontinence. Who are the personnel behind many of these changes? University senior O&G academics – Richard Tracy in 1865 after Melbourne university established in 1862, Marshall Allan 1929, Ivor Hayes and JW Johnstone 1950, Lance Townsend 1951, Roger Pepperell 1978, Shaun Brennecke 2000. Other university academic O&G personnel – James Brown, Eric Mackay, Norman Beischer, Don Aickin, Michael Permezel, Hugh Robinson, James Evans, Gordon Baker, Alex Lopata, John McBain, Michael Quinn and many others. University Neonatal Paediatric staff – Kate Campbell, Bill Kitchen, Colin Morley, Lex Doyle, Peter Davis. Hospital personnel – Most of the consultant Medical staff in Obstetrics, Gynaecology and Neonatal paediatrics, including other specialist personnel such as the pathologists (Hans Bettinger, Harold Attwood and Denys Fortune). Without the cooperation between all of these personnel, many of these changes would not have occurred or would have been delayed. Many of these changes would not have been possible without research funded by the University, Hospital or other bodies. Publications were 100 per year by Salaried Departmental staff (50% Obstetrics, rest neonatal paediatrics, oncology). At least another 30 per year by non University salaried RWH staff (honorary). It is essential that this support continues to ensure Melbourne University and the RWH remain as well recognised across all disciplines detailed today in the future. RWH delivers more babies each year than any other hospital in the Southern Hemisphere of the World, apart from South Africa, its staff are world recognised for their expertise and massive publication numbers particularly in Obstetrics, Neonatology, Infertility care including IVF, and Oncology, and it is still heavily involved in local, Australia wide and International comparative trials in many of the specialist areas.